The Highwaymen in concert featuring (L to R) Willie Nelson, Waylon Jennings, Johnny Cash and Kris Kristofferson. The Highwaymen were a “supergroup” of four country-music giants—Waylon Jennings, Willie Nelson, Johnny Cash, and Kris Kristofferson. They released three studio albums between the mid-1980s and mid-1990s: Highwayman (1985), Highwayman 2 (1990), and The Road Goes On Forever (1995). When the Highwaymen performed concerts, they often mixed in their solo material with that of the group on stage. All four men had been friends for decades prior to their musical collaboration, and their friendships and occasional musical partnerships continued after the supergroup disbanded. Since the deaths of Jennings, in 2002, and Cash, in 2003, Nelson and Kristofferson have gotten together from time to time to play music. In the words of Rosanne Cash, John’s daughter, the Highwaymen “came out of pure friendship. There was no marketing guy who came and said, ‘This will be a good idea.’” The idea originated in 1984, when the four men were in Switzerland filming a Johnny Cash Christmas TV show. They spent a lot of time jamming together when not filming. They had so much fun that they decided to record together when they got back to the states. Although the four Highwaymen were longtime friends who always admired and respected each other, they each had strong, independent, highly individualistic personalities and musical outlooks. Waylon was the outlaw rebel/good ol’ boy with the rock’n’roll attitude. Willie was the wise pot-smoking hippie guru. Kris was a Rhodes scholar and movie star who had scored several hits on the pop charts. John had seemingly been everywhere and done everything. Waylon probably had the best singing voice in the group. Willie was probably the best overall musician. Kris was undoubtedly the best songwriter. And John was simply a living legend whom everybody knew. There were also political differences, with Kris mixing his left-wing politics with his music, much to Waylon’s annoyance (according to later comments by Waylon’s wife Jessi Colter). The combination of these dissimilar people and diverse artists served the Highwaymen well and became a key to the group’s magic and success. On many of their released songs, the four men shared vocals as they took turns singing the lyrics in their own styles. On other songs on their albums, only one or two of them sang up front, though the others provided background vocals. On the Highwayman album, released by Columbia Records in 1985 and produced by Chips Moman, the four singers were credited only by their individual names. The name of the group was subsequently borrowed from the hit title song, an unusual ballad about reincarnation written by Jimmy Webb. The song follows a soul through its embodiments as a highwayman, a sailor, a dam builder, and a starship pilot. Marty Stuart, then Cash’s son-in-law, had suggested that the quartet record the song. “Highwayman” was the band’s only number-one single, and it was honored with a Grammy Award. 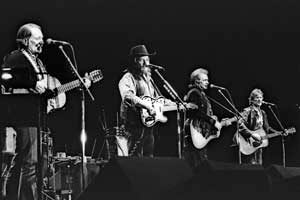 The four artists billed themselves as the Highwaymen when they started touring together in 1990. However, the use of that name led to a bit of legal trouble, with members of a 1960s folk group that had called itself the “Highwaymen” suing the country supergroup in 1990. The lawsuit was dropped when—following a suggestion by Waylon—the old folkies were allowed to open a show for the new Highwaymen in Los Angeles. The Highwaymen perform “Highwayman” live on stage at Farm Aid 1993. Another chart hit from the group’s debut album was “Desperados Waiting for a Train,” a heartbreakingly sad song written by Guy Clark and previously known from other singers’ versions. Johnny Rodriquez joined Cash and Nelson on singing Woody Guthrie’s “Deportee (Plane Wreck at Los Gatos).” Other outstanding songs on this album included new versions of Ed Bruce’s “The Last Cowboy Song”; “Big River” and “Committed to Parkview” (both written by Cash); and “The Twentieth Century is Almost Over” (written by Steve Goodman and John Prine). Johnny Cash’s “Big River” gets the Highwaymen treatment in New York City’s Central Park. The Highwaymen’s second album, Highwayman 2, released by Columbia in 1990 and produced again by Moman, may be the most creative effort of the group. The Highwaymen’s recording of “Angels Love Bad Men,” featuring Waylon on the chorus. Interesting songs of social commentary on the album were “Born and Raised in Black and White” (written by Don Cook and John Jarvis) and “American Remains” (written by Rivers Rutherford). The latter song was suggestive of “Highwayman” in having the singers portray a shotgun rider, a river gambler, a Midwest farmer, and a Cherokee Indian. Most of the other songs on the album were written by Highwaymen members, including “Songs That Make a Difference” (John); “Anthem ’84” and “Living Legend” (Kris); and “Texas” and “Two Stories Wide” (Willie). The supergroup’s recording of “Born and Raised in Black and White,” about the contrasting lives of two brothers. The Road Goes On Forever, released in 1995 by Liberty Records, was produced by Don Was. It was the only album on which the group was called the Highwaymen. The record failed to produce any chart hits despite containing high-quality material. Kristofferson’s “Here Comes That Rainbow Again,” from the 1995 album The Road Goes On Forever. Other fine songs from the album included the title number written by Robert Earl Keen Jr.; “Death and Hell” (written by Cash and his son John Carter); “Live Forever” (written by Billy Joe Shaver and his son Eddy, who would die in 2000); “The Devil’s Right Hand” (Steve Earl); “It Is What It Is” (Stephen Bruton, John Fleming), and “True Love Travels a Gravel Road” (Dallas Frazier, A.L. Owens). An expanded version of this album—featuring additional songs and a documentary DVD— was released in 2005. Video of “It Is What It Is,” showing the four musical greats having fun while recording the song. The success of the Highwaymen established a model that would be repeated in rock music in 1988 with the formation of the Traveling Wilburys, consisting of George Harrison, Bob Dylan, Roy Orbison, Tom Petty, and Jeff Lynne. However, Harrison apparently came up with the idea for his supergroup on his own—with no prompting needed from “Waylon and Willie and the boys.” Both bands demonstrated that music fans enjoy hearing and seeing groups of their more-mature heroes performing together. In 2014, Willie and Kris performed a medley of “Highwayman” and other songs at the Grammy Awards presentations. They were joined on stage by Merle Haggard and Blake Shelton. Haggard revealed in 2015 that he had been invited to be the fifth member of the Highwaymen back when the group started, but he turned down the offer. In 2016, a three-CD set was released by Sony Legacy, titled The Highwaymen Live—American Outlaws. The CDs, along with an accompanying DVD/Blu-ray, features material mostly from a live 1990 concert. Also in 2016, American Masters—The Highwaymen: Friends Till the End premiered on PBS. The documentary featured interviews with surviving band members, friends, and family. It highlighted the ways that Waylon, Willie, John, and Kris each fought for and won their artistic freedom. Playlist of songs from The Highwaymen Live—American Outlaws. Joseph Hudak. The Highwaymen: The fights and friendship of country’s great supergroup. Rolling Stone. May 20, 2016. The Highwaymen: Friends Till the End: About the film. PBS, American Masters. 2016.